Alen Grand Guys! You will learn about the best Disney Stories here! The stories created by Disney are those of fairy tales and fantasy. Usually, a hero will have to overcome insurmountable odds in order to succeed, but very rarely do they do it alone. As with superheroes in comic books, it's the same with Disney stories. The main character, be it the hero or princess gets by with a little help from their friends, the sidekicks. Now, in the world of Disney, anything is possible, so sidekicks can take on the form of any creature, willing and loyal to the end, whether they are life-long friends or newly acquainted. 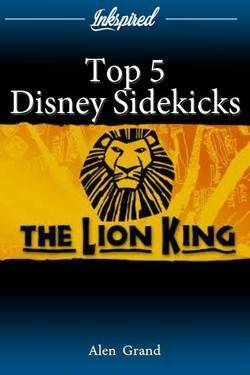 So let's take a look at the top 5 Disney sidekicks. The super-cop horse starts his journey hunting down Flynn Ryder in pursuit of the stolen crown. It takes more than brawn to evade this clever horse though as he tracks down is adversary through the forest where Rapunzel is hidden. However, this cunning quadruped is willing to put aside his differences with Flynn so that Rapunzel can see the floating lights on her birthday. When this happens we find that Max isn't actually a ruthless horse bent on taking down criminals. He is actually quite a good friend and begins to warm to the couple, including Pascal, the little chameleon. In the end, Max rallies together some ruffians to save Flynn from the dungeons and evade the palace guards just in time to save Rapunzel from her evil captor. What a horse! I think we can all agree that Ariel's decision to change her fins to legs for the price of her voice was a little hasty. But, hey, that's love I guess. In fact Ariel's actions almost cause Sebastian, the little crab, to have multiple heart failures and as King Neptune's advisor, he's worried about losing more than just his job. Despite pleading with Ariel not to go through with her deal with the evil sea witch, involving a catchy 'under the sea' tune, he sticks with her until the end. In fact he even helps her win over the prince with another catchy tune and if it wasn't for the sea witch, he would have succeeded. This is one loyal maestro I would like to have on my team any day of the week. Eddie Murphy provides the voice of one of his most memorable animated appearances. I'm talking about Mushu the dragon of course! Even under the threat of the entire Hun army, Mushu helps Mulan become a fighting warrior for the Chinese dynasty. Although his advice might be a little questionable at times he honours the family descendant's wishes by sticking with Mulan even in the face of an avalanche! Mushu fulfils his duty by saving the Emperor and fighting off the a little help, but still in is plucky style. Although spending the first moments with Dory might be a little frustrating as she forgets things that happened 5 seconds ago, she manages to stay faithful throughout. Even through the face of danger, she manages to stay positive and her approach to dangerous situations encourages Marlin to plough on in the search for his missing son, Nemo. What's heart-warming about this friendship is Dory's ability to remember things when she is with Marlin. She even memorises 42 Wallaby Way, Sydney! Her ability to speak whale is doubtful though. Even at the end when Marlin is about to give up, Dory reunites him with his son as a result of her selective, but brilliant, memory. Timone and Pumba, The Lion King that was grown into the best Las Vegas show for everyone. The tickets on this event available on lion king show tickets las vegas that will teleport you for the best family perfomance in the USA. Hakuna Matata! If there was ever a tune that defined a childhood, it was this, first introduced by Timone the streetwise meerkat and Pumba the endearing warthog. Forming an unlikely alliance with Simba, this trio lived the carefree style in a rainforest munching on bugs and if it's one thing these guys lived by, it was to have no worries. These chaps could have easily stayed in their cushy lifestyle and left Simba to challenge Scar on his own, but nope. They stick with it right through to the end, even when chased by a pack of ravenous hyenas. If anyone needed a true friend it would be these guys. 1.- Top 5 Disney Sidekicks Aug. 31, 2018, 7:13 a.m.